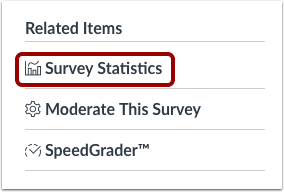 You can see graded or ungraded survey results after one or more users have taken the survey. Graded surveys display in the Gradebook and SpeedGrader, while ungraded surveys do not. The Item Analysis report is not available for surveys. 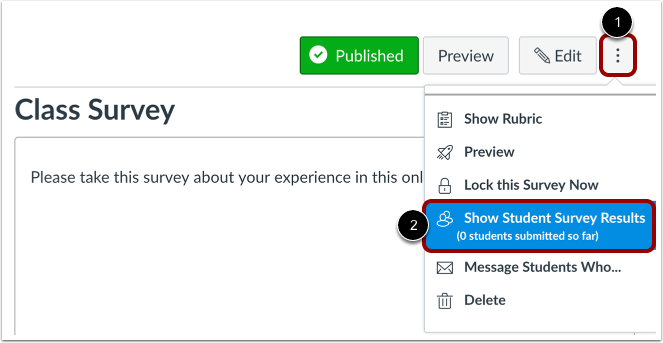 You can filter survey statistics using the first 10 sections of your course. Click the Options icon  and select the Show Student Survey Results link  to view individual submissions. Under the Students who have taken the quiz heading, click the name of a student . You can also see a list of students who haven't taken the practice quiz. The warning icon  indicates a submission that needs review. In the sidebar, click the Survey Statistics link to view all the responses to the Survey. Note: To view responses to essay questions, view individual submissions or download the Student Analysis CSV. View the Survey statistics . You can view an entire summary that shows all score percentages. The summary also shows the quiz average score, high score, low score, standard deviation (how far the values are spread across the entire score range), and average time of completion. To filter Survey statistics, click the Section Filter button  and choose the section that you would like to view. Note that you can only view the first 10 sections of your course. To access additional Survey results, generate a Student Analysis report. 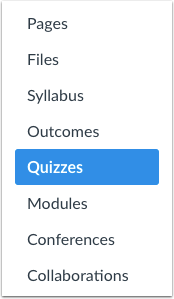 Like quiz statistics, you can also download Survey results by clicking the Student Analysis button. Note: By default, the submitted time in the Student Analysis report is shown in UTC, not your set time zone. Previous Topic:How do I create a survey in my course? Next Topic:How do I view practice quiz results in a course? Table of Contents > Quizzes > How do I view survey results in a course? Re: How can I get data from a Likert scale survey? Re: Is anonymous assignment posting possible? Re: Is there a way to add a checklist to a page?